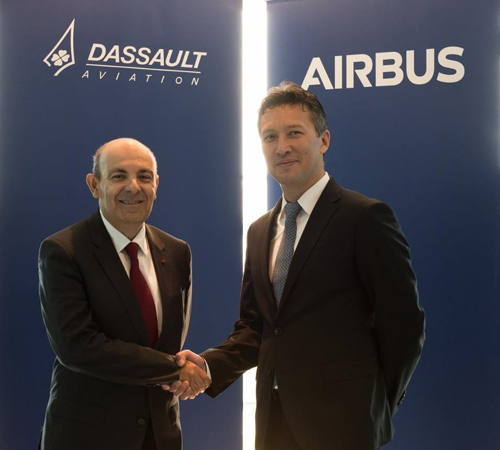 Dassault Aviation and Airbus have decided to join forces for the development and production of Europe’s Future Combat Air System (FCAS), which is slated to complement and eventually replace current generation of Eurofighter and Rafale fighter aircraft between 2035 and 2040. The partnership, sealed at the ongoing ILA Berlin Air Show (25 to 29 April 2018) by Eric Trappier, Chairman and CEO of Dassault Aviation and Dirk Hoke, Airbus Defence and Space Chief Executive Officer (CEO), represents a landmark industrial agreement to secure European sovereignty and technological leadership in the military aviation sector for the coming decades. “I am convinced that European sovereignty and strategic autonomy can and will only be ensured through independent European solutions. The vision that France and Germany have set forth with FCAS is a bold one and it’s an important signal in, and for, Europe. The FCAS program will strengthen the political and military ties between Europe’s core nations and it will reinvigorate its aerospace industry,” he added. “Never before has Europe been more determined to safeguard and foster its political and industrial autonomy and sovereignty in the defence sector. Airbus and Dassault Aviation have absolutely the right expertise to lead the FCAS project. Both companies are already cooperating successfully on Europe’s medium altitude long endurance new generation drone program,” said Dirk Hoke, CEO of Airbus Defence and Space. “FCAS takes this successful cooperation to the next level and we are absolutely committed to tackling this challenging mission together with Dassault Aviation. The schedule is tight, so we need to start working together immediately by defining a joint roadmap on how best to meet the requirements and timelines to be set by the two nations. It is therefore of key importance that France and Germany launch an initial joint study this year to address this task,” Hoke added. Dassault Aviation and Airbus Defence and Space agree on the importance of efficient industrial governance in military programs. This also includes the involvement of other key European defence industrial players and nations based on government funding and on the principle of best contribution. Overall, FCAS defines a system of systems combining a wide range of elements connected and operating together, including a next generation fighter aircraft together with Medium-Altitude Long-Endurance Unmanned Aerial Vehicles (UAVs), the existing fleet of aircraft (which will still operate beyond 2040), future cruise missiles and drones flying in swarms. The overall system will be interoperable and connected in a larger perimeter with mission aircraft, satellites, NATO systems and land and naval combat systems.